I’ve always had a fascination with other people’s stories. Maybe it’s the marketer in me, trying to uncover the distinctions of each individual’s “brand.” And as a newcomer (even though I’ve lived here nearly two decades), I’m infatuated by tales of farming, ranching, “commuting” Teton Pass with cars dragged by horse teams, and feeding a family, all winter, off of the fall kill. 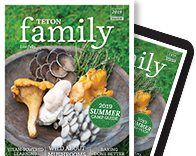 In light of this interest, I uncovered the history of four Teton families: why they came here, how they sustained themselves, and how their modern livelihood varies from that of their early ancestors. In the process, I found that the personalities of the new school Teton move-ins really aren’t so far removed from the old school homesteaders. It’s just a little easier now. After meeting Billie Garnick, ninety-six, and her granddaughter, Jessica, it’s hard for me to believe her statement, “Back in the day, the men were the bosses in our family.” You see, Billie was a modern woman long before feminism was hip. And while the Garnicks’ roots might not go as deep as some, their history in Jackson has surely left its mark. Bill, 101, (a former Marlboro man who never smoked a day in his life) and Billie Garnick followed their son, Cameron, and his wife, Vicki, to Wyoming in 1965, where they opened a dude ranch just north of Moran. For Bill, born and raised on a farm with a degree in agriculture, dude ranching seemed a fun segue from his existing cattle ranch in Nevada. Billie, a teacher and music professional, was attracted to the “performance” of dude ranching, where you put on a daily show for guests. 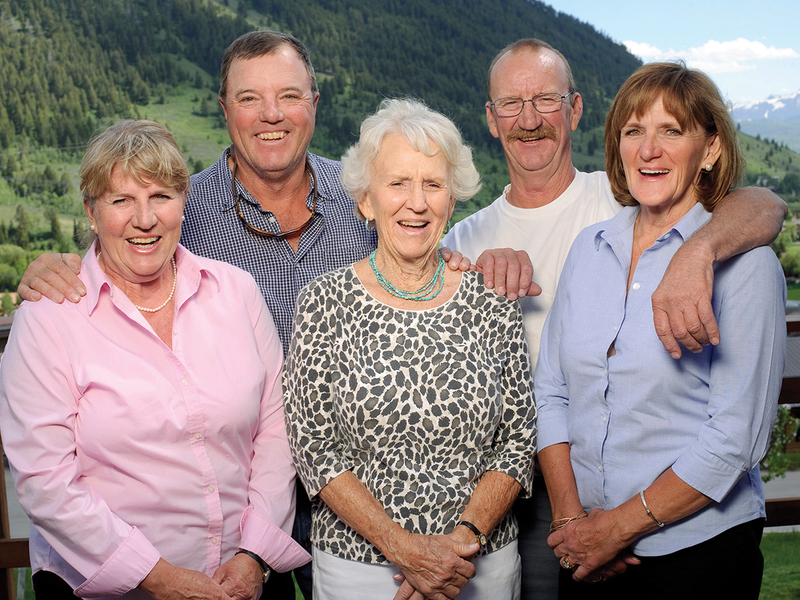 And so it began: Cameron and Vicki ran their theater (Jackson Hole Playhouse) and ranching businesses, providing strong role models for their eight children, with Bill and Billie by their side. Jessica labels her family the “singing and dancing cowboys.” Currently, her three brothers live in Manhattan. Creed just finished a Broadway musical, while Sky and Golden are studying the arts. Vanessa Garnick Boshoff, Jess’ older sister, lives in Panama and owns an aerial production company with her husband. Savanna Garnick lives and performs in Nashville. Rachel Zimmerman, a mother of four, runs the Jackson after-school programs. And Jess’ youngest sister, Cheyenne, performs in local school shows. Despite the geographical spread, Jess prefers staying close to home, keeping the Western music genre alive. “When you’re used to waking up on the ranch, wrangling in the horses from a two-thousand-acre pasture, and walking out your back door and not seeing anybody for miles, that’s a hard thing to give up,” she says. Jess explains that the mission of her production company, NeverSweat Productions, is to create a sanctuary that celebrates the heritage and traditions of Western living. When I asked Billie how family living today differs from back then, she explains that there were no distractions, no outside influences. Her family worked hard every day with a sense of camaraderie that you don’t see much in modern times. Ranching and performing offered them freedom—the opportunity to do what they wanted, when they wanted. “It’s been a wonderful life; we have many blessings,” Billie says. I remember meeting Meredith at Grand Targhee in the ’90s. He was a ski instructor and a Smith Optics ambassador. My boyfriend—now hus-band—and I had just arrived on the scene to teach snowboarding. “If you need goggles, talk to Meredith,” a senior instructor advertised. Back then, I had no idea how deep his roots ran (back to the 1800s) or that I could also talk to Meredith if I needed wool or meat. Today, Meredith works his family farm, raising sheep for both uses and growing hay and barley with his cousin, Lorin. After visiting with Meredith, I strolled across the street to the original Rigby homestead property, where Uncle Grant and Aunt Sharol live. There, I uncovered the Wilson story. In June 1888, Grant’s grandfather, Thomas R. Wilson, came up from Utah to investigate the fertile cattle country and land with many creeks. In March 1889, during the Homestead Act, his family left Salt Lake by wagon brigade, settling on 160 acres north of Driggs, which they later traded for land in Alta that was more favorable to farming. The family eventually acquired 360 total acres, all of which—void of one or two acres—is still farmed by them. “I had a marvelous life on the farm, taking care of animals, harvesting, and skiing behind the sleigh,” recalls Grant, son of T. Ross Wilson and a scholar with a doctorate degree in education. Grant taught in the Idaho schools, was the principal at Teton High, and held the position of district superintendent for nineteen years. Working in education complemented his life on the farm, where summers off meant tending to animals and crops. It was a good combination. “Life was easier then because we did everything [meals and chores] together,” Grant explains, while his wife, Sharol, notes that today’s farm machinery has actually made the profession easier. Instead of bucking and moving bales by hand, you can now do it by machine. “One can now do the work of many,” she says. Meredith and his wife, Dana, carry on the family’s legacy of educating and farming. In the winter, Meredith guides on the National Elk Refuge, and Dana works as a counselor in the Idaho schools. “I love to be outdoors,” prides Meredith. I guess that’s why he carries out the family tradition of winter teaching (guiding) and summer farming. Not everyone has a mountain named after them. But the Rammell family of Tetonia is the exception, residing just down the draw from their namesake. Shayne Rammell recites the story of his gold-struck ancestors who forged a road to their Rammell Mountain mining claim. They never found gold, but the cabin they built served as a nice hunting camp and hideout from park authorities looking for poachers. Charles H. Rammell came to the States from England in 1851. He was a blacksmith and expedition fighter (and, judging from the builds of the modern Rammell men, you probably wouldn’t have crossed him). Charles and his wife headed north from New Orleans via wagon train as he fought his way up the Mississippi and then headed west, finally landing in Utah. In 1898, they were sent to colonize Teton Valley, Idaho. They settled in Hayden, just west of Tetonia on Highway 33. Shayne Rammell has his own story. Grandson of Arthur Leon Rammell, the first of the Rammells born in Teton Valley, Shayne worked in the plumbing trade, following his father’s footsteps. He was one of the first commuters of Teton Pass. “You could count them on your hand,” he recalls. “There were the Redi-Mix guys, a few forest service workers, and the Wilson Construction crew.” Back in the ’70s, the west side of the pass was brand new, but the east side was all switchbacks. Travel was slow, and a lack of four-wheel drives forced them to chain their tires and follow behind the plow. Today, the Rammells run a successful plumbing operation, Three Peaks Plumbing. I met Shayne and his three sons, Doug, Greg, and Andrew, when they plumbed our Tetonia house. Recommended by friends, their professionalism on the job wasn’t without the occasional crack on the “hippie” carpenters. There was never a dull moment on the jobsite as a bond formed between the powder-crazed newcomers and the local valley boys. Shayne paraphrases Harry Potter: “We do what’s right, not what’s easy. It’s the Rammell way.” And while he reflects on how he missed a lot of his boys’ youth due to long workdays, he’s now able to experience the satisfaction of the men they’ve become. As he nears retirement, Shayne plans to spend a lot more time on the river, with his sons, just like his hunting and fishing ancestors. Doris’ grandfather, John Henry Wilson (relatives of the Jackson Wilson clan), came to the area with the first settlers over Teton Pass. Similar to the Idaho homesteaders, this troop left Utah for the promise of fertile grounds with lots of grass for cattle. In 1906, Doris’ father, Lewis Henry Wilson, was born in South Park, an area homesteaded by their family. Even as a boy, Lew worked hard, but always snuck in fun while wrangling cattle. As the story goes, it would sometimes take Lew seven hours round-trip, with all the “horse play” involved, to drive cattle only a few miles. Lew paved the way for a work-and-play existence, lived out by Doris and Clinton Budge as they raised a family of their own. Doris drove a dump truck beginning at age fourteen. “Women jumped right in and did whatever the men did,” she recalls about the early Jackson years. Clinton worked in the construction trade, doing what he could to “survive” here. “In those days, you didn’t have a job in the winter,” Doris remembers. “You’d charge your groceries at the store and pay them off the next summer.” After years of piecing together a livelihood, Clinton and Doris started their own company, Northwestern Construction. Despite all the hard work, Doris and Clinton encouraged recreation by finding creative ways to earn ski passes for their four children, Karen, Donna, Barb, and Rick. On the weekends, they picked pine cones to sell to the forest service for reforestation projects. The money made was spent on skiing. Every day after school, the kids would haul their gear a few blocks to the “horsey hill” (Snow King), where they all learned to ski race. And the efforts paid off. While all the children excelled at racing, their oldest daughter, Karen Budge Eaton, competed in the Olympics in 1968 and 1972. When I asked Donna Budge Clark, Doris’ daughter, about the values her family has taught her, she proudly recites, “work hard and stay connected as a family.” She also notes the importance of being self-sufficient and prides her children for carrying out the family’s legacy. In a modern yet still unpredictable mountain society, it’s comforting to know that others have trod before you. And while their family plights may seem comparatively harsher, the values of the wagon brigadiers searching for fertile land surprisingly mimic those of ski bums on a quest for powder snow. Maybe one day, our children will have a “deep roots” story of their own to tell—one where their parents existed on pasta and adrenaline, somehow survived the economic downturn, and carried on the self-sufficient heritage of the families of yore. : “We do what’s right, not what’s easy,” explains Shayne Rammell, pictured here third from left with his sons, Andrew, Greg, and Doug. Jessica O’Neal celebrates the heritage of Western living with her production company, NeverSweat Productions. 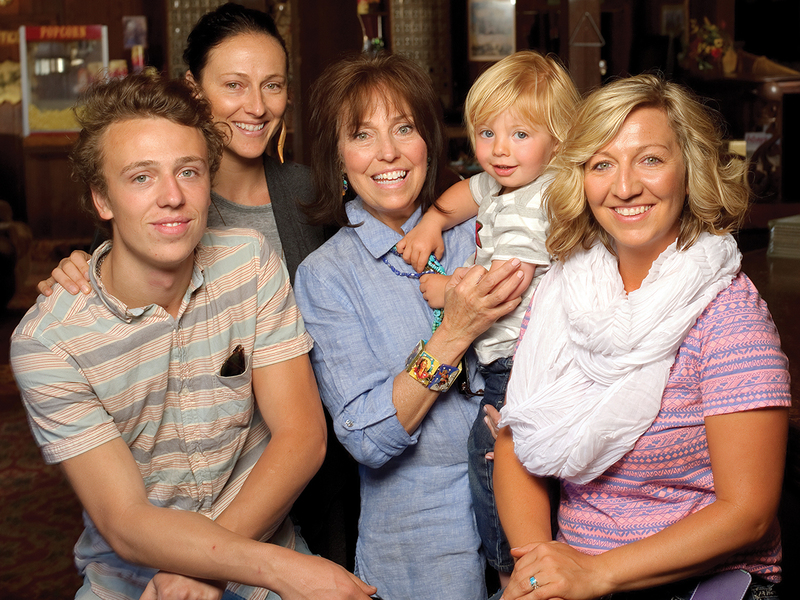 Here she is, far right, with siblings Golden and Savanna Garnick, mother Vicki, and son Gideon. 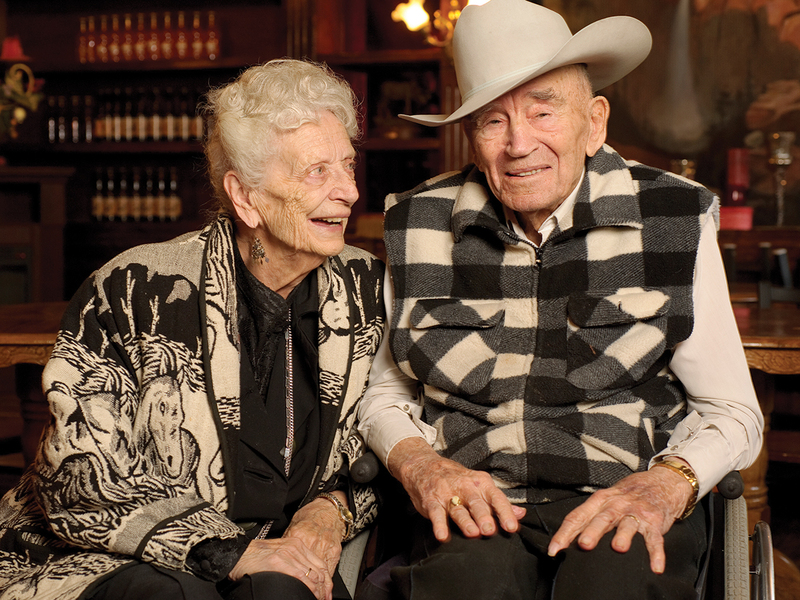 Billie and Bill Garnick, 96 and 101 respectively, cherish the freedom their family’s ranching and performing livelihood afforded them. 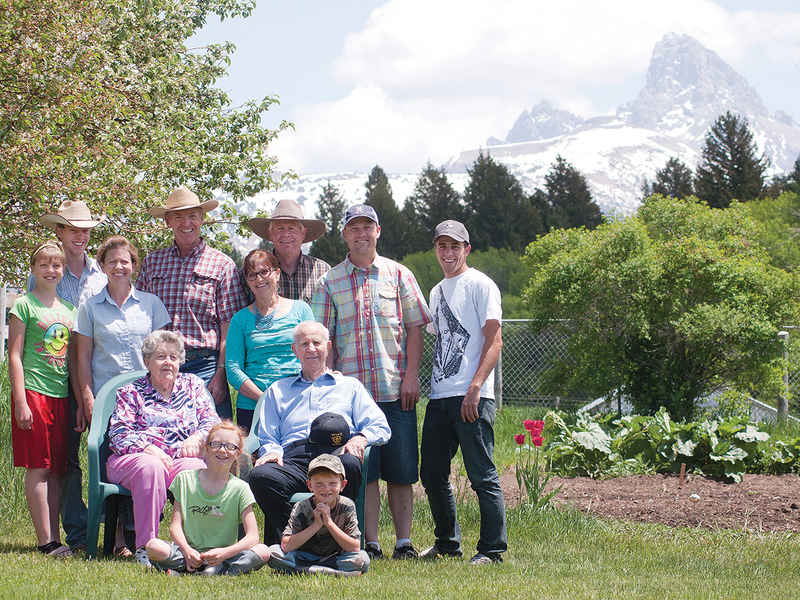 Together, the Wilson family farms 358 acres in the shadow of the Tetons; some of the land has earned Century Farm status. Back row: Amelia, Gabriel, Dana, Meredith, Liza, Lorin, Grant, and Tavner. In chairs: Sharol and Grant. Front row: Eliza and Gideon. : Donna Budge Clark recognizes her family values of hard work, play, and self-sufficiency. She’s pictured here, far right, with sister Barb, brother-in-law Richard Pack, mother Doris, and brother Rick, from left to right. The year: 1957. The place: Hillside Motel (where Sidewinders currently sits). 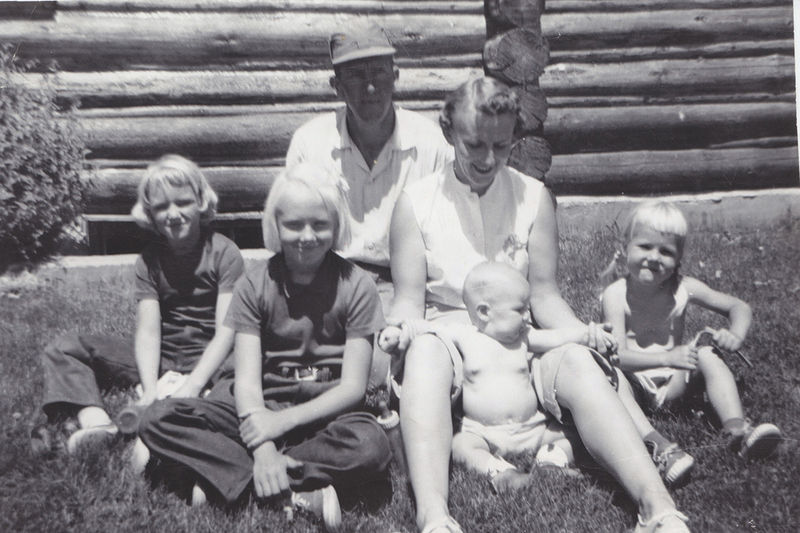 The lineup, from left to right: Donna Budge Clark, Karen Budge Eaton, Clinton Budge, Doris Budge holding Rick Budge, and Barbra Budge Pack.